Here’s a linguistic quandary: The Italian word gnocchi is usually translated as ‘dumplings’, and the dictionary defines the word ‘dumpling’ as “a small mass of leavened dough cooked by boiling or steaming” or “a piece of dough, sometimes filled, that is cooked in liquid such as water or soup”. Well, gnocchi alla romana defy these definitions: they’re not made with a dough, not filled and not cooked in liquid or by steaming either. Heat the milk with a dash of salt and a nice nob of butter. When the milk just comes to the simmer, add the semolina in a slow stream—in Italian they say a poggia or “like rain—into the simmering milk (just like you make polenta). Lower the heat and let the mixture cook until it has become quite stiff, mix in some grated parmesan cheese. Off heat, whisk in the egg yolks if using. 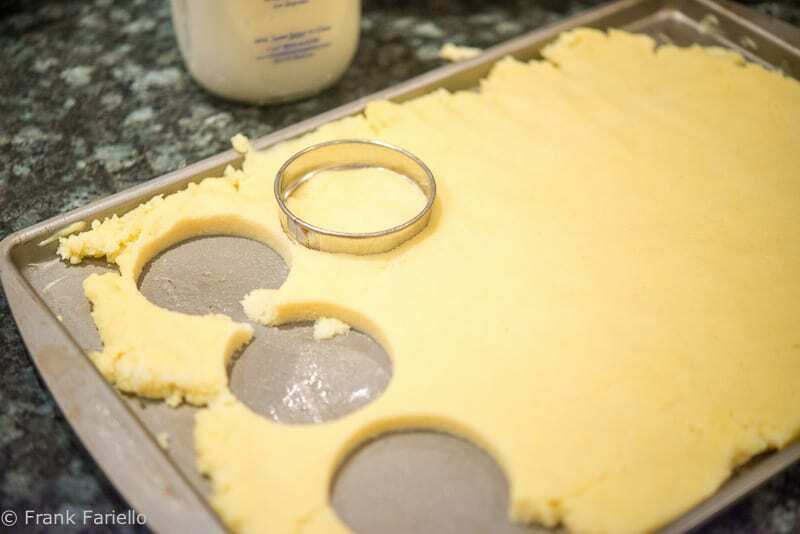 Let the semolina mixture cool completely (it speeds things up considerably if you stick the baking sheet into the fridge) and then, using a glass or cookie cutter, cut out disks of the semolina. Arrange those disks in a buttered baking or gratin dish, layering them in slightly overlapping rows like so many roof tiles. Top with copious amounts of grated parmesan cheese and melted butter. Some recipes also call for grated gruyere which, of course, makes for an even richer dish. You then either bake the gnocchi in a hot oven (200° C, 400° F) or pass it under the broiler until nicely browned on top. Let the sizzling gnocchi ‘settle’ for a few minutes and then serve them in their baking dish. 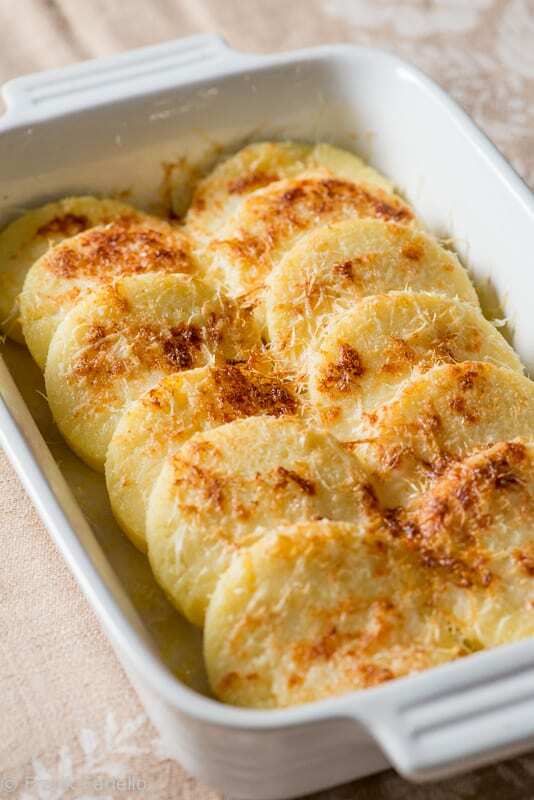 Gnocchi alla romana are very rich, so you do not need any kind of sauce, although one correspondent tells me that she serves these with ragú for her husband, who does not care for the taste of butter. The egg yolk (or two) is optional; it gives the gnocchi a richer coloration and a slightly firmer texture. Try it if you like. Personally, I find that the broiler technique is both quicker and more appealing, as baking in the oven takes 15 minutes or more, by which time the gnocchi can dry out a bit. But if you want to prepare the gnocchi ahead of time, the oven-baked method is the way to go. Heat the milk with a dash of salt and a nice nob of butter. When the milk just comes to the simmer, add the semolina in a slow stream—in Italian they say a poggia or “like rain—into the simmering milk (just like you make polenta). Lower the heat and let the mixture cook until it has become quite stiff, mix in some grated parmesan cheese. Arrange those disks in a buttered baking or gratin dish, layering them in slightly overlapping rows like so many roof tiles. Top with copious amounts of grated parmesan cheese and melted butter. 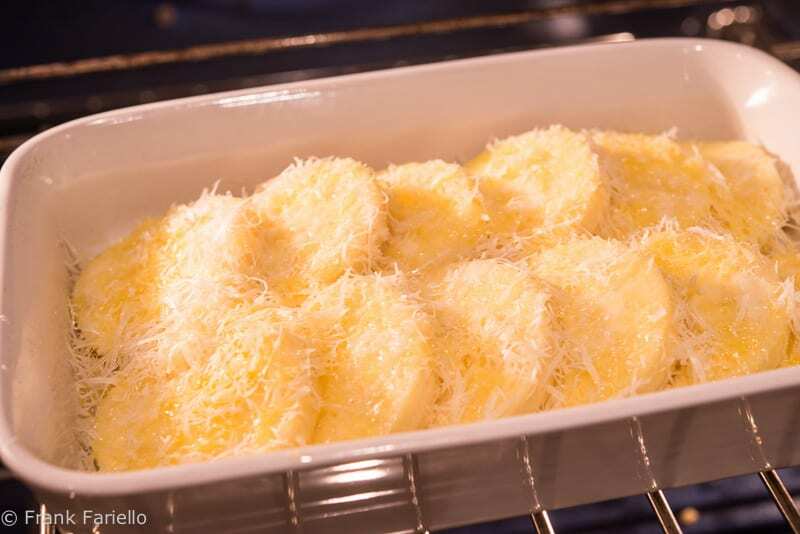 Some recipes also call for grated gruyere which, of course, makes for a richer dish. Amazing recipe Frank! It’s truly remarkable, how your ancestors managed to cook such delicacies with so little. We loved the recipe and we’ll be trying it out with graviera from Naxos. I’m not at all familiar with this form of gnocchi but wish that I was. They sound delicious and love the idea of the crunchy exterior that the broiler would develop. I need to try this recipe. Thanks, Frank, for sharing and for today’s lesson. Quite right. I’ve corrected the typo! What an interesting dish! Never heard of this type of gnocchi, but I like it. And you can never have too much butter, so I’d pile in on (although the idea of a ragu is appealing, too). Thanks, John! I don’t make these too often, but they’re a nice change of pace. And they’re actually less fuss than making potato gnocchi. A classic and copious amounts of butter and Parmigiano are a must! With the weather changing I am definately ready for Gnocchi alla romana. Ciao Frank! Big favourite in this house! And I do chill the dough…so much easier to cut the rounds. I use a wet off-set spatula to spread out the mixture and that seems to work well. Yummy stuff! I could eat them for breakfast…OK fessing up we have with an egg…I know…weird…or maybe not…depending on how you look at it! Wonderful! I can imagine the meatiness of this dish, but with the lightness of gnocchi. Almost like a semolina version of polenta! Indeed it is. And you can make leftover polenta the same way. Delicious! I guess we’re even since I haven’t ever tried pizzelle. They sound delicious. Please do, David. Curious to know what you think of them! Great recipe, Frank! The rendition I have is from my mamma – hers was gnocchi in brodo. She used cream of wheat, parmesan cheese, and egg or eggs depending on how many she wanted. Her gnocchi were so light they dissolved in our mouths. So when I started looking in Italian cookbooks for a recipe similar to hers, the closest I found was the Gnocchi alla Romana. I’ve always promised myself I would try it and I can’t wait to do so. Buon weekend. And I like the sound of your mamma’s gnocchi. Will definitely give it a try soon! Hi — this version comes out great. One note: what I learned to do with the scraps after the disks are cut, was to lay them in the baking dish first as a base layer, before you make the tile arrangements on top. That way, no leftovers! I sometimes stir in minced fresh oregano, and/or some sauteed bit of bacon, if I have them on hand. Great rendition of this classic dish. I like your tip for what to do with the leftovers. I usually press them together and roll them out to make a few more disks, but they always look a little sloppy. Your idea is much better! Let us know what you think, Claudia! sono buonissimi sia in questa versione semplice che in quella più ricca che faccio qualche volta. Aggiungo fra una fetta e l’altra del prosciutto e formaggio, a volte del ragù di carne, insomma è una ricetta versatile che piaceveramente a tutti ! Buona settimana Frank ! La prossima volta dovrò provare la version più ricca… grazie dell’idea, Chiara! These have to be one of my favorite comfort foods. I make them more often than the “potato” version and they freeze well too, in the uncooked state. I’ve got some from last winter waiting to be cooked. Thanks for reminding me. Oh, but we love this one in our house. I just made some last week to go along with a nice pork roast. It finally felt like fall here, so I went for it. Perfect for the chill, and perfect with pork, agree! Another wonderful classic, one I haven’t made in ages. Thanks for the reminder Frank. Buon weekend. Hi, Zuza! Thanks for your comment. Your gnocchi dish sounds wonderful–and I love your website. You know, I actually lived in Rio for 6 months, a long time ago… wonderful memories! Hi. I'm from Brazil and morew than the recipe, I really liked your vision over what to do with the dough out of the disks. Nice idea. I sell that gnocchi with a mignon ragu with porcini and red wine. You can put a little bit of cinnamon. Try. Nice to meet you.